Because I like to pay my bills while also offering you all great ideas and resources, affiliate links are included in this post. 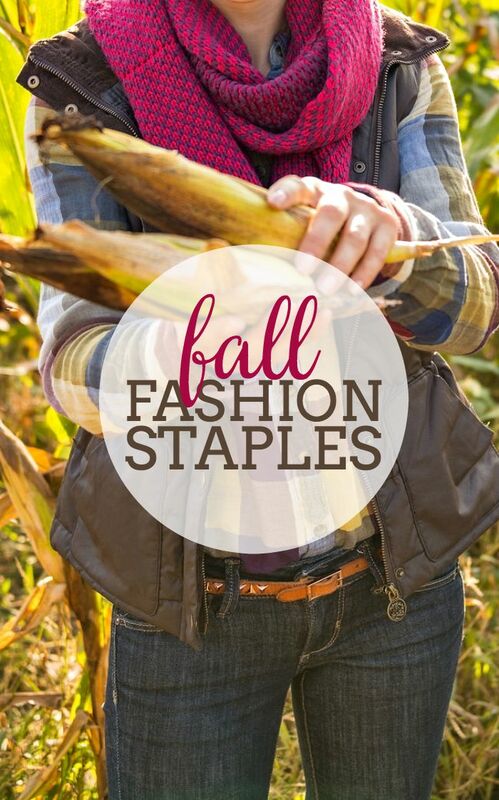 Fall Fashion Staples to build a great fall wardrobe! Fall is my favorite season! I love the cooler weather, the fresh air, and the open windows. I love corn mazes, apple picking and pumpkin spice everything. I love the start of tv season! But what I love most of all is fall fashion! While I love warm summer weather, I don’t feel as comfortable in little shorts and tank tops as I do jeans, boots and a comfy sweater. Fall clothes are just generally more flattering for every body shape and offer so much variety. There are still days for t-shirts and rolled up jeans but you can also get cozy. It just perfection in my mind. Although it was hard to narrow the list, here are my Fall Wardrobe Staples! I honestly don’t know what I do without my jean jacket and I’m sure there have been times my family wanted to toss it in the trash. It is my number one fall staple though and generally makes every list of fall fashion. It goes with just about everything – jeans, khakis, skirts, dresses. It all works! I feel my most comfortable and me in colored jeans, boots, a scarf and a jean jacket. Here are some cute ones I found when looking around! The one of the left is closest to my own jacket. At first, I felt very hesitant to plaid. I’m not sure why, but it didn’t always feel like me. But now that plaid is everywhere and the choices abound, I am a converter. I big converter. You can easily find plain in any color and pattern size and you look instantly adorable with a pair of jeans and boots. I’m loving the combo up above and will be on the hunt for a similar vest for myself! Booties are something I am desperately in search of this season. I want more variety in my wardrobe because these are so versatile. A pair of booties like the two on the left are fun for going out with friends, while the third style would be my go to for running errands. The last pair? Absolutely perfection with jeans for a date night. Cute, comfortable and so very in! Now, booties are cute for nice fall days, but riding boots are my staple not only for fall but summer and spring, too. For three seasons out of the year, I live in these boots! They have little to no heel, making them comfortable. I’m not just saying that either. I have worn my riding boots for miles of walking around Chicago! The black pair down there, second from the left, comes is so many cool colors. Not only is there a really pretty cognac I want, but they come in blue, pink, red, etc (making them perfect for Halloween depending on the costume need). Oversized sweaters with a pair of skinny jeans is ultimate comfort in my book. Adding a few high quality oversized sweaters will give you a polished yet comfortable style that’s perfect for every day fall. It works for football games, coffee, pumpkin picking, and even a laid back date night. Every year I try to go through the closet and purge. One thing never gets tossed out – a scarf! Every year I let my collection grow because I wear them almost every day. Even at home. One reason – and I’m bringing you all into my confidence for this one – is because it’s a comfort thing for me. Like a baby blanket I guess. For more legit reasons, it’s an easy way to dress up a t-shirt or bring a fun pattern to a simple dress. It can change the whole look. Depending on the scarf, it can also help hide some body concerns in the way it hangs, especially around the waist. I’m hoping to add all of these to my collection this year! Aztec is very in right now, but I started falling for it around two years ago when Bryan gave me a fabulous aztec cardigan sweater. It immediately became my favorite. With their bold and often colorful designs, they are easy to wear. You can throw them over a simple long sleeve tee and you look put together. The two middle sweaters down below are on my wish list! What are your fall wardrobe staples?